We are a full service entertainment company and have been a revolutionary force in the Pacific North West specializing in “East Coast and West Coast style” Bar and Bat Mitzvah party entertainment for over two decades. Premier Entertainment offers a variety of packages with a range of prices and available crew to choose from - allowing us to personalize your teen’s special day! The Elite offers our most experienced staff, choice of your favorite MC, and the best high-energy party entertainment on the West Coast! This package combines the best in sound with an incredible light show - it has it all: black lights, laser simulators, fog machine, and a laser holographic DJ booth and backdrop. The Showcase adds a dazzling light show, unique DJ booth, and live performances by your guests! A new level of excitement is added for both the young guests and their families when they are incorporated into the actual performance through the use of costumed dance and lip-sync skits. 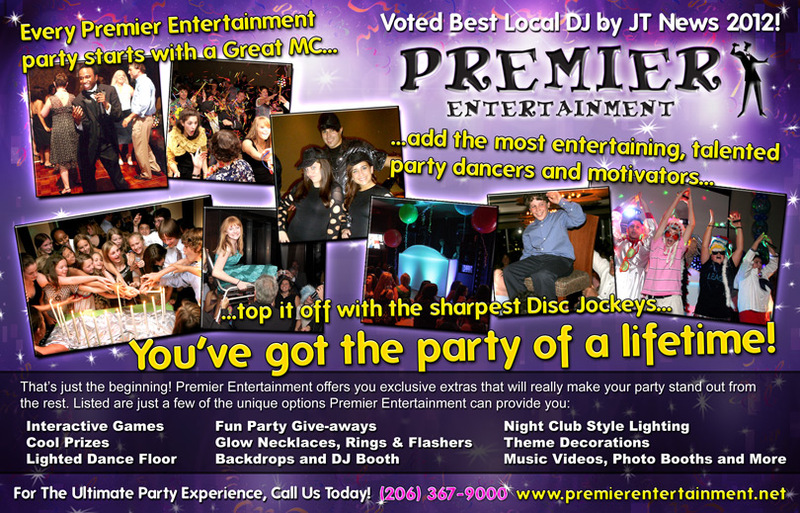 Much more than DJ entertainment, The Party package ensures a successful event for you and all of your guests. Included is everything offered in The Basic: DJ, MC, Party Props™ and Party Gear™.